I grew heaps of beautiful chiogga beets this year, and they just keep coming in the CSA. I can’t bring myself to compost those healthy greens, so I blanch and freeze some of them for winter and use the rest as I can. 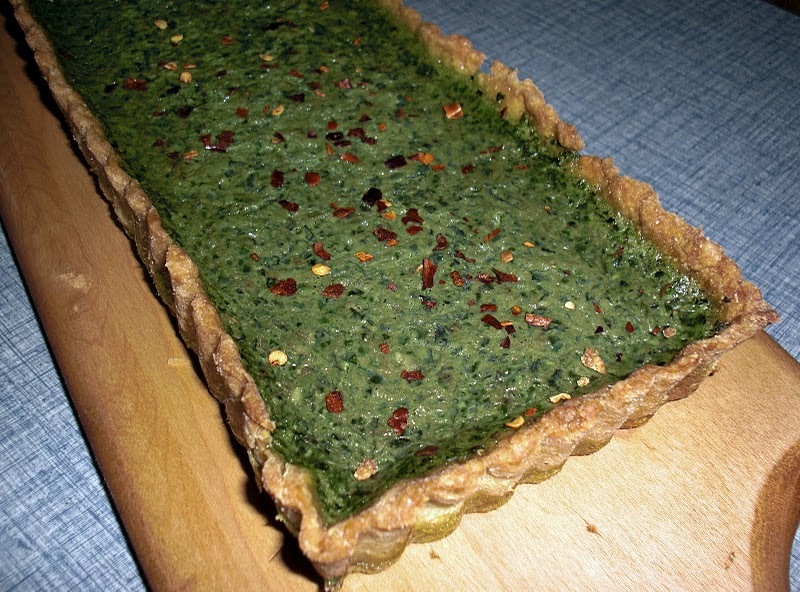 While searching for a new and guest-worthy recipe, I can across this one for a turnip green tart. I used beet greens instead, rice milk instead of the heavy cream, and some parmesan instead of the gruyere (so, not the same recipe at all). I also had a homemade pie crust waiting in the freezer, and decided to use that instead of making a new cornmeal crust. I was worried that the pastry crust would be too sweet, but my guests loved the buttery sweetness with the beet green flavor. It’s too hot in Philadelphia to turn your oven on today (98 degrees!) but you can always blanch and save your beet greens now and save them for later. Looks wonderful and a good way for me to use up some of my chard!